Lightly sweet, perfectly moist, and full of shredded carrots & zucchini! 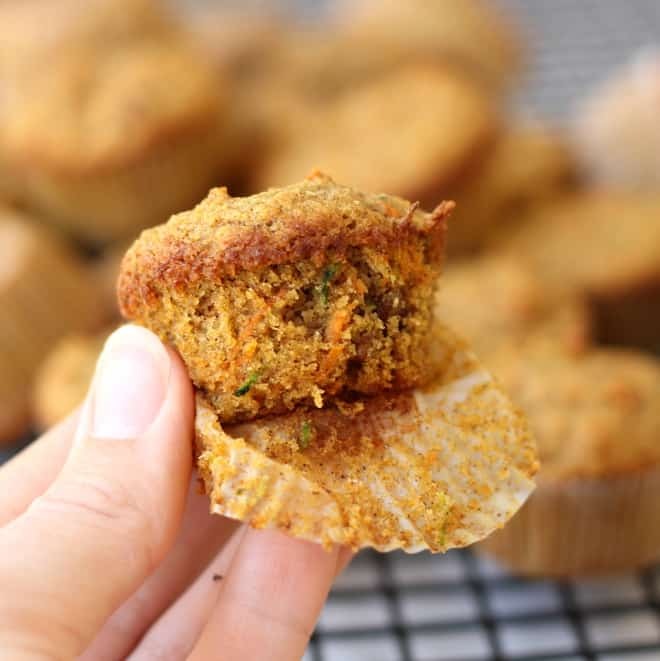 Kids and adults both love these Carrot Zucchini Toddler Muffins. I am always looking for sneaky ways to get my toddler to eat more vegetables. I think he does a pretty good job with most vegetables. He could eat broccoli, asparagus, and green beans for days. We do struggle with the leafy green vegetables, though. He is yet to appreciate a tossed salad. I have to sneak all his kale and spinach into smoothies and soups. He also loves kale chips which I’m not complaining about. 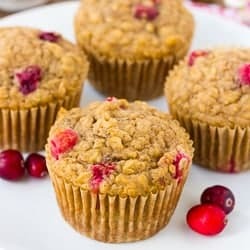 While these muffins don’t contain any leafy greens, they are absolutely delicious for both toddlers and adults. They are full of shredded zucchini and carrots, lightly sweet, and perfectly moist. These muffins are perfect for play groups, afternoon snacks, or baked off as regular size muffins for breakfast. We’ve talked about how I need muffins in my life before. These muffins were enjoyed by everyone in my house and I’m sure we will be making them again and again! Lightly sweet, perfectly moist, and full of shredded carrots & zucchini! Kids and adults both love these. Preheat the oven to 350. Line a mini muffin pan with liners or oil lightly with coconut oil. In a large bowl, mix together the almond flour, brown rice flour, salt, baking powder, baking soda, and cinnamon. In the bowl of a food processor, combine the coconut oil, maple syrup, egg, and vanilla extract. Pulse until thoroughly combined. Add the dry ingredients and pulse until well incorporated. Stir in the shredded vegetables with a wooden spoon. Fill the muffins cups 3/4 of the way full. Bake for 15 minutes, or until lightly golden. Cool for 5 minutes in the pan. Enjoy! I would love to make these, but I don’t use brown rice flour. Anything that could be substituted? Usually I only use almond or coconut flour. Hi LeAnne! If I were to guess you could use all almond flour and and an extra egg. I haven’t tried it that way but think it might work! Let me know if this helps. 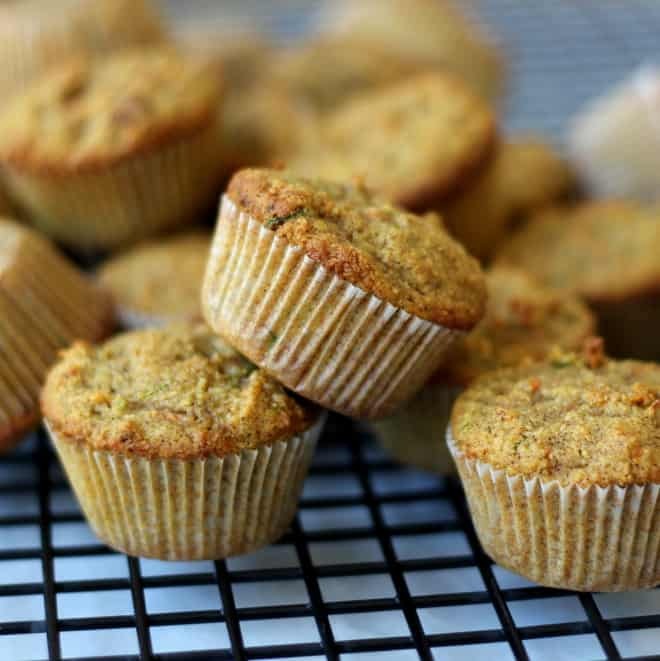 If not, I have a paleo zucchini muffins recipe that is very popular! I used coconut flour in place of the rice flour and they turned out amazing!! I’m just wondering did you sub out the rice flour and coconut flour for the same amount? Oh my gosh I love this recipe!! You’re ingredients are natural and simple and I feel like I can taste the spices in the muffins just by reading the ingredient list and looking at your pictures. I love how your toddler loves eating veggies, hallelujah. Every toddler I know always says they’re “allergic” to green things. These were fantastic. Fantastic. Very well spiced and flavorful, and the texture was as good as any baked good out there. My daughter and I (who both eat gluten) almost ate them all before my wife got home, but I was able to exercise some self control. I didn’t have brown rice flour nor enough almond meal, so I used 3/4c almond meal and 1/2c bobs red mill gluten free all purpose flour. Substituting some teff flour or a (very) little amaranth flour could also work well, I imagine. I will definitely try these again with some other flour variations, as I have several sitting in my freezer that need to get used. I will try to remember to report back my findings. I’m so happy they turned out! Great to know about the substitutions! I’m not sure what the ingredients in that mix are so I can’t say if it would work or not! Almond flour is a little different than most gluten free blends. Sorry about that! Good luck adjusting to gluten-free! Thanks for the brilliant recipes! Is there anything I can use to replace the egg in this recipe? I’m so happy to hear this! I’m glad you liked the muffins! Oh my goodness these muffins are the best muffins I have ever made! And the best part is that my 16 month old toddler loves them! I’m excited to make more of your recipes!! Both my 20 month and 4 yr old sons love these muffins. Every time I make them I say next time I need to double the recipe, as they don’t last through the day in my house. Everyone (including hubby) gobbles them up. Very moist, tasty and healthy. I made them once without the egg, substituting a flax egg. They still tasted good, just not nearly as fluffy. Also an easy recipe that my 4 yo loves to help make. Erin, another nicely done recipe! My friends and I are addicted to these muffins! 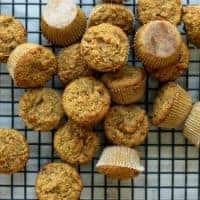 Hi Erin, I made these muffins for my toddler and followed the recipe exactly, they were delicious but were falling apart and crumbling. Any ideas? Should I add another egg? Thanks! Hi Laura! I would try adding 1 tablespoon of whole psyllium husks or 1/2 teaspoon xanthan gum. You could also try adding 2 tablespoons of ground up chia seeds! I hope this helps! What should the consistency of the batter be? Mine is like like a very moist cookie dough…i can shape it slightly. Or should it be more runny? Hi! These taste great but completely crumbled when I took them out of the muffin tin. The only change I made was using gluten free all purpose flower instead of the almond flower. Any suggestions? Thanks! Almond flour holds baked goods together much better than gluten-free all-purpose flour. Since gluten-free all-purpose blends have varying flour combinations a 1-to-1 swap probably won’t work here. Love this recipe! I have made these multiple times and as my son loves them so much! For the best flavor I recommend organic cinnamon, I’ve noticed at least for me it makes a big difference. I’ve also added one banana to the mix on occasion and they seem to hold together a little more. Would you happen to know the calories and nutritional information per muffin? Thank you! Delicious!!! I’m going to have to hide the rest or they’ll be gone before sun down! These turned out delicious. And my 14 month old LOVES them. I did use all purpose flour instead of almond flour, though. Will make them again for sure. Did you use brown rice flour with the all purpose flour? I’m so happy the hear this! My 1-year-old loves these too! And I totally sneak a few whenever I make them too – so good! This looks amazing! My son can’t eat almonds, is there another flour I could use that would work? Thank you!! 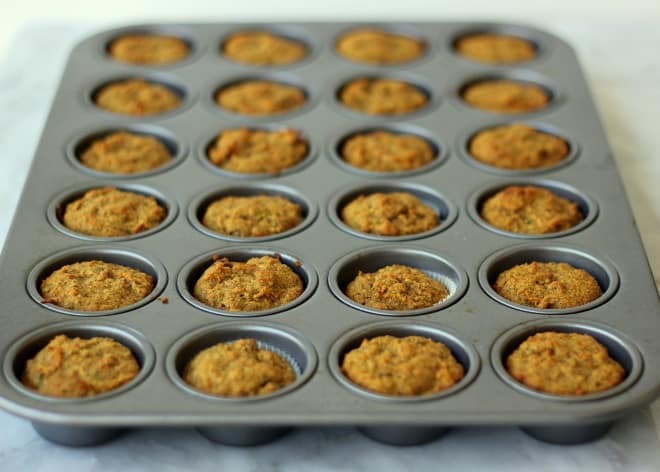 I just tried zucchini and carrot toddler muffins.. they are so awesome!! Loved this recipe!! It’s a keeper!! So glad you liked the muffins! Can you give me the calorie count of these? Love the ingredients for this recipe…but my muffins are so crumbly, driving me bonkers when my 16 month old eats them because they make such a mess. These are So yummy! I used Almond Flour instead of Brown Rice Flour and added an extra egg…but they were still a bit soggy and messy. Any other suggestions? 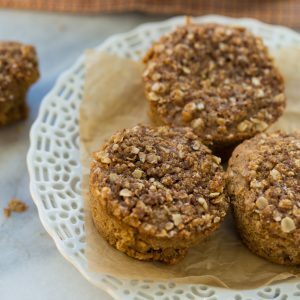 Almond flour is much more moist than brown rice flour so it would greatly change the consistency of these muffins! I would try it with the brown rice flour. Can I use a regular muffin tin? I do not have a mini muffin pan available…. Yes! You might need to increase the baking time by 5 minutes but that should work fine. I used a regular muffin tin but it only made 9 muffins. I still baked them for 15 minutes and they turned out great! Very good. Not too sweet. I subbed corn flour instead of the rice and avocado oil instead of the coconut. They turned out light fluffy and moist. I filled the muffin tins full so they would have nice muffin tops and they turned out beautiful. Thank you for this great recipe!! I subbed out rice flour for wheat flour and made 12 in a regular muffin pan (I added about 10 min additional baking time). Came out great! These look fab although I don’t have almond flour. Would they work with all buckwheat flour instead? Hello, I cant find zucchini because ut is out of season. Any there anything else I could use? So good!! My only regret is that I didn’t triple the recipe. Made these muffins tonight and they were delicious!! I know my 11 month old with gobble them up. How do you recommend storing them (Fridge/counter)? Also have you ever tried freezing them? Great question! I would add 5 minutes to the bake time then check the muffins for standard size. They probably need a few more minutes than mini muffins. These are my kids favorite! I love sneaking in extra veggies. These muffins are AMAZING! I just made them and they are heavenly. Thanks for the recipe. What are the nutrition facts. 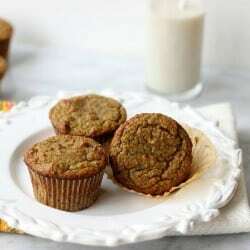 Carb, protein content in your muffins? I am diabetic and need to count carbs etc. Would be really helpful too. These are seriously the BEST!! 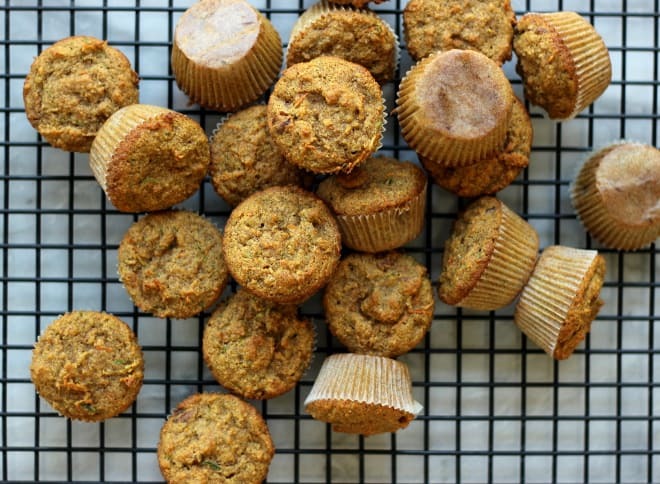 They taste more like carrot cake to me than healthy, gluten/dairy-free muffins for my LO! I give them to him, and then eat one myself. I’ve passed this recipe on to 3 family members in just 24 hours. Will keep for years to come!!!! I really want to try these but dislike maple. Do you think Honey or Applesauce could replace it and which would work better. I like the idea of applesauce. This recipe is delicious. I used flax egg in place of egg. I used ALL oat flour and agave syrup instead of maple. It came out perfect. I made them twice in two days because my family gobbled them up. Delish! The flavor is spot on! I did not have brown rice flour on hand so I used all almond flour and added an additional egg as suggested. The muffins were a little “slack” but to be fair I did not follow the recipe exactly. I’ll have to experiment next time but I will be adding this recipe to my repertoire for sure. Yum! Delicious! The two toddlers I watch love them. I did use regular flour (1 1/4c) instead as it’s what we have on hand. They are a little dry but I don’t mind. Will definitely make them again.